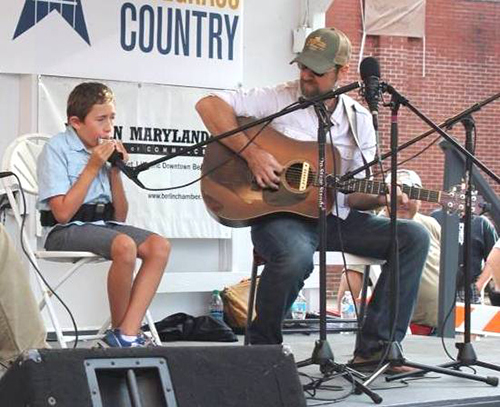 OCEAN CITY – Singer/songwriter Frankie Moran will always remember the 2014 Berlin Fiddler’s Convention as the precise moment his 12-year-old son Cole took center stage. “I think what I remember the most was the thunderous applause after we finished our song, and being really thankful that I was wearing my sunglasses, because they were hiding my tears of joy,” said Moran. Their performance culminated in the second place prize in the group competition and a “most inspirational performer” prize for Cole, but the moment instantly went down as one of the most memorable in the Fiddler’s Convention’s 22-year history. Nate Clendenen, local musician and music director of the Fiddler’s Convention, was standing just offstage and remembers the moment well. Cole, now 13, was born blind, and was diagnosed with Charge Syndrome shortly thereafter. It’s a rare pattern of birth defects that can cause heart and breathing problems, along with a range of other medical conditions. In Cole’s case, those conditions include significant cognitive delays, apraxia, which inhibited his speech until age 5, and early onset scoliosis. Frankie, a Stephen Decatur High School alum, and his wife Jenny, left the Eastern Shore and moved to a Baltimore suburb to be close to Cole’s doctors, but soon realized that their young son not only had an incredible passion for music, but also had perfect pitch. By age 3, Frankie turned Cole onto the harmonica and by age 7, he was starting to turn heads with his playing. Last year’s Fiddler’s performance didn’t just launch Cole’s talents into the spotlight, it started the father-son band that has been on quite the musical ride covering countless miles of open road, more than 40 gigs this year, and an album that has sold through its first pressing of 500 copies. 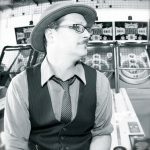 Blind Wind has been featured on television, radio, newspapers and magazines in small markets here in the region and in larger markets nationwide in the past year, but despite the attention and the growing number of fans, Frankie says life is still pretty much the same. Blind Wind will perform again this year at the Fiddler’s Convention on Saturday and Frankie admits it will be exciting to come back to the place where it all started. Moran says spectators will see a more polished act than last year, and they will see and hear the confidence his young son has accrued over the course of a year’s worth of stage experience. Moran remembers back to a time when Cole was first diagnosed, and he struggled with the harsh realization that he might never be able to take his son surfing or play catch in the backyard. But now, when he watches the crowds react to Cole’s harmonica playing at shows, he feels full of fatherly pride and untenable happiness. Cole is now an eighth grader at the Maryland School for the Blind in Baltimore, and his newfound notoriety has not gone unnoticed by his peers, and his teachers. Moran says doing a show in Berlin always feels like coming home, but this year he says the Berlin Fiddler’s Convention feels a lot like coming back to the beginning.